Right before we head out for the holidays we like to have a special meal just the two of us at “our home”. We cook something special, open a bottle of bubbly and exchange gifts. It is a nice way to ease into the crazy holiday schedule. 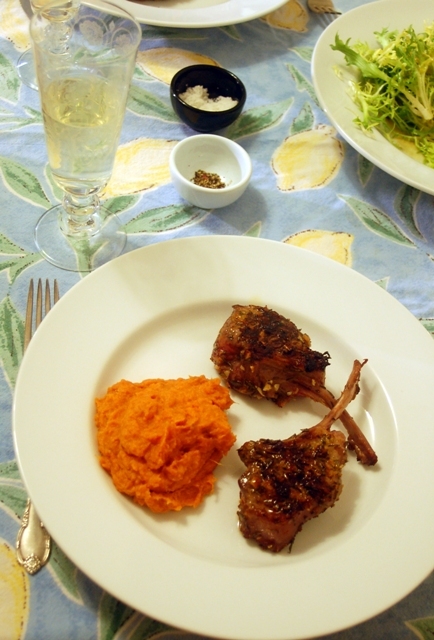 When we received the package from Annie at Lava Lake Lamb, we put aside some French Rib Chops, just for this occasion. I love French Rib Chops as I feel they really dress up a casual meal, they are so elegant in presentation and tender in taste. I use to make this particular recipe often, many years ago but have not done so in a while. I love the combination of the orange zest, garlic, and rosemary with the creamiest of the lamb. As well, being grass-fed lamb, there is a nice sweet grassiness that is very pleased with this combination of herbs. I decided to serve this dish with mashed sweet potatoes that we simply prepared with a little butter, milk, and salt. This meal would make for an elegant but simple New Years Eve meal. Mix zest, garlic, and rosemary together in a bowl. Pat dry the lamb chops and coat very well with the herb mixture. Heat a grill pan until hot, drizzle a small amount of olive oil into the pan. Sear each side of the chops until golden brown, about 3 – 4 minutes, depending on how pink you like the centers. 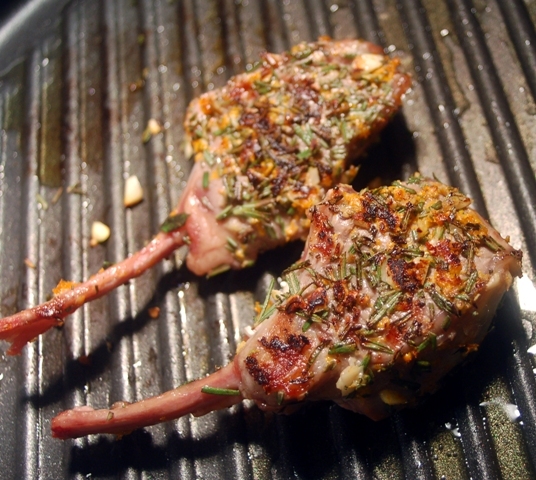 8 Responses to "Herb Citrus Crusted Lamb Chops"
This dish is a very elegant way to present your sophistication to some. I think that it is best to use lamb locally, as I find that it just helps out those who produce it. Plus, you can make a nice sauce for the lamb out of the trimmings if you "French" the racks by yourself. we have a small garden at home that has herbs and vegetables"""